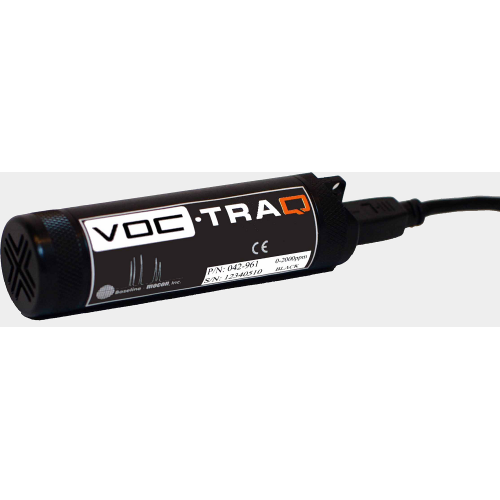 The VOC-TRAQ total volatile organic compound (TVOC) detector is the easiest way to monitor and record TVOCs using any PC with a Windows® operating system. Using the award winning Baseline®-MOCON® piD-TECH® plus photoionization detector makes the VOC-TRAQ the most reliable, accurate, and inexpensive portable TVOC detector on the market. The USB compatible VOC-TRAQ can operate while connected to a PC, or it can remotely store up to 36,000 sample readings with the detector’s internal memory using the optional rechargeable power supply. Alarm levels are programmable with LED and/or audible notification. The VOC-TRAQ is also compatible with numerous USB accessory options.